Every day people in our community are facing issues that, if left unsolved, can lead to a downward spiral. United Way 2-1-1 is our way of connecting people in need to resources as quickly and as efficiently as possible, 24 hours a day, seven days a week. United Way 2-1-1 is an easy-to-remember phone number linking people in need to relevant information. When you call 2-1-1, you will speak with a trained Information and Referral Specialist who will help you access the exact service you need. 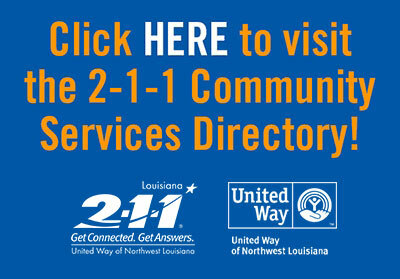 By maintaining an accurate database of public and community-based resources, United Way 2-1-1 connects you to basic services and even at times of disaster. You can also use the online Service Directory to search for resources near you. 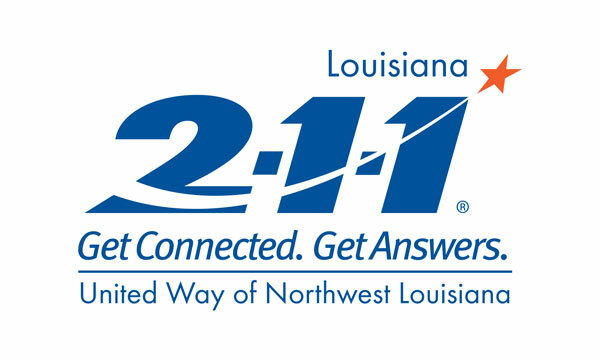 United Way of Northwest Louisiana is a proud partner of Louisiana 2-1-1 and works closely with the Louisiana Association of United Ways to bring this service to our area. 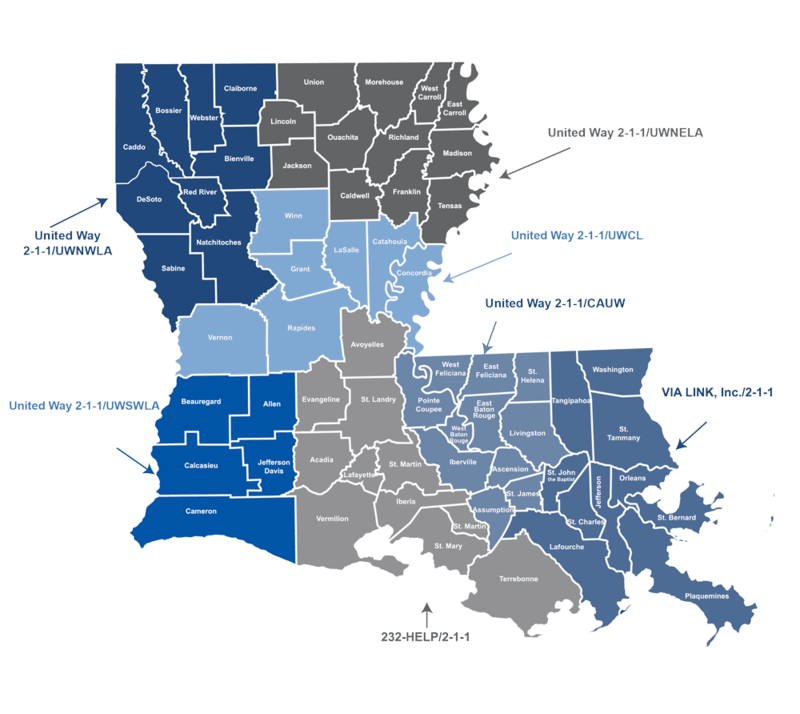 Proudly serving the parishes of Bienville, Bossier, Caddo, Claiborne, DeSoto, Natchitoches, Red River, Sabine and Webster. WHEN YOU CALL, WHO ANSWERS? 2-1-1 calls are answered by trained Information and Referral Specialist working out of a centralized call center in Louisiana. Each call is directed to providers within a geographic region. Offers multilingual services, and information for the hearing impaired. Utilizes a computer Service Directory of resources and services statewide. Works collaboratively with nonprofit agencies, faith-based organizations, and government. Abides by the standards established by the Alliance of Information and Referral Systems and is endorsed by United Way Worldwide. One call gives you access to resources across your community and the region. 2-1-1 is efficient, fast and easy to use. No more wrong numbers. No more wasted time trying to find the right resource(s). 2-1-1 maintains the integrity of the 9-1-1 system, saving that vital community resources for life and death emergencies. 2-1-1 strengthens our community by uniting people in the area who want to help those in need. People who want to help often do not know where to begin. Almost 900,000 nonprofit organizations are in the U.S., plus scores of government agencies. People looking for assistance have trouble navigating a complicated web of health and human service programs. 2-1-1 is a planning tool. Based on aggregate data about the types of calls received, communities can better anticipate demand for services, and mobilize resources to meet the changing needs. 2-1-1 touches the lives of every person in the community, and whether you are in a situation where you need help or find yourself later in a situation to give help, 2-1-1 is always there for you. 2-1-1 is a critical information system necessary prior to, during, and after a community crisis, such as an attack, flood, tornado, fire, or other local or national tragedy. Prior to a crisis, it is critical that an information system is in place that responds to the crisis at a moment’s notice. 2-1-1 responds immediately during times of crisis, to field calls regarding the crisis, and direct callers to services most appropriate for their needs. 2-1-1 maintains a permanent presence in the community and people can find the help they need whether their needs arise a week or several years after the crisis event.